Before I get too carried away, I want to talk about what I did a few weekends ago. 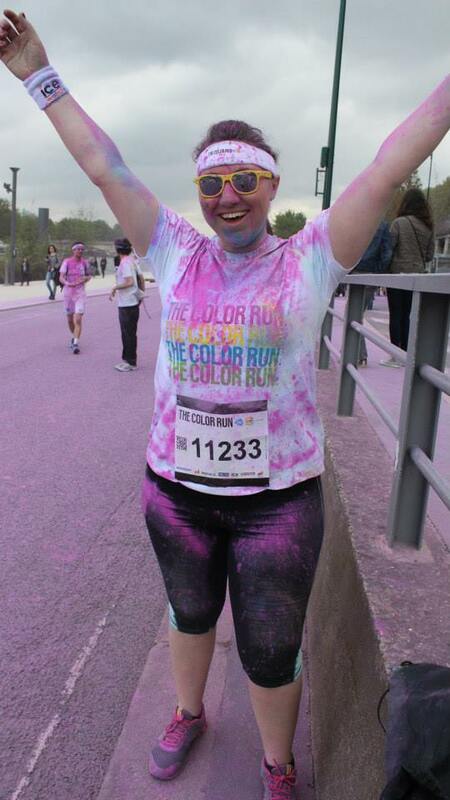 I spent April 11-13 in Paris and participated in the Color Run! It was absolutely amazing! It was my first 5K, and I wasn’t as prepared for it as I could have been, but I had a great time! There were about thirty of my fellow classmates from France Business School that participated as well which made it so much more enjoyable! 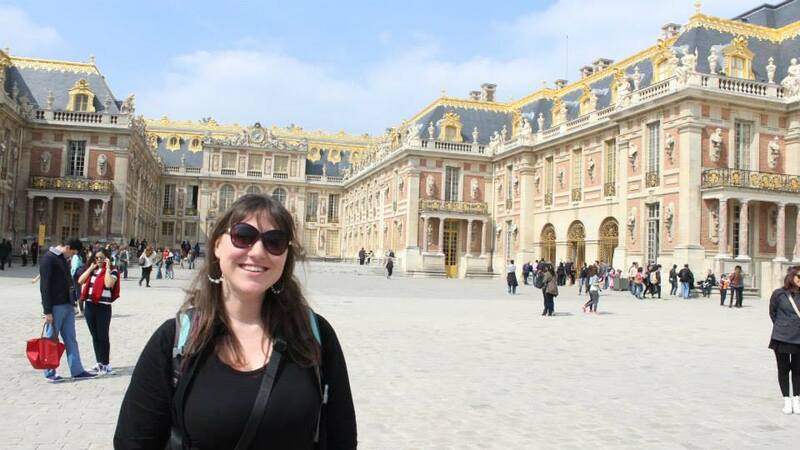 A group of us made our way to Paris on Friday night, and spent Saturday at Versailles. It was nothing like I had expected! I was so impressed with the grounds and the gardens! Unfortunately, our group got separated in the beginning and half of us went into the palace, while the others started in the gardens. We met as we switched and were all exhausted already! Making my way to the gardens, my friends and I headed towards a grassy area near the main pond. There were many people there having picnics and taking a break so we decided to do the same thing. Within 10 minutes, all 4 of us were asleep! We napped on the palace gardens on the most perfect day for an outdoor snooze! After our rest, we started touring the gardens and were impressed beyond words. The size of the garden grounds alone are almost impossible to cover in one day! There were lots of exhibits and fountains as well! I had a blast and am so glad I was able to make it to Versailles! 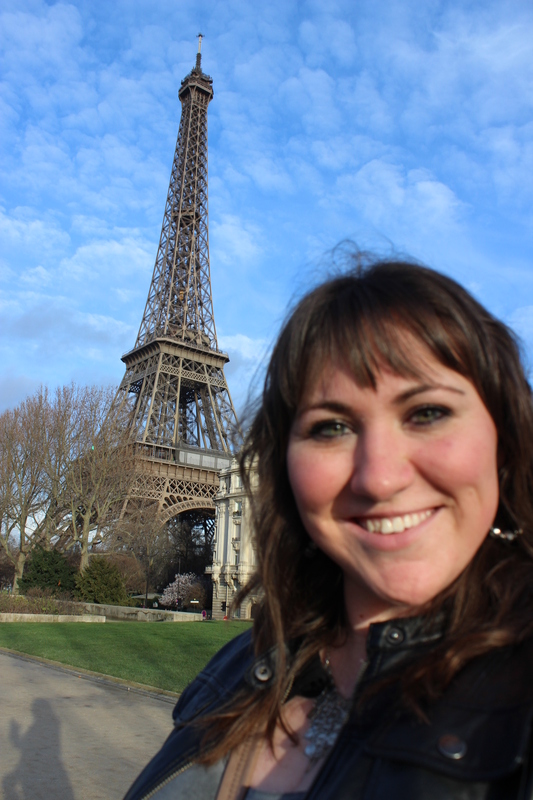 I highly recommend that everyone goes while they are in Paris! Sunday was the day of the Color Run. I woke up energized and ready to rock! It started at Hotel de Ville (which is like the City Hall), so many of the students from FBS agreed to meet near a fountain there and try to all stay together during the run, (even though it didn’t last long!). I knew I wasn’t going to be able to run the whole thing, especially going to Versailles and walking so much the day before! My knees, which I’ve had multiple injuries with the past few years, have been holding up well in Europe, knock-on-wood. I knew if I pushed too hard, I would be paying for it for weeks, so I took the slow & steady approach and it worked out perfectly! Kajsa was sweet enough to stick with me while the others ran ahead and got all full of color! For those of you who don’t know about the Color Run, it’s known as the “Happiest 5K on Earth!” At each kilometer, you get sprayed with a different colored powder and by the end of the race you look like a rainbow! It is a mixture of cornstarch & food coloring that is thrown at you as you cross each kilometer. The race is intended to promote happiness & healthiness, and I know it did both for me! I looked like a kaleidoscope by the finish line (which made for an interesting train ride home a few hours later! ), and had a blast running through each kilometer knowing I was that much closer to the finish. It was even better that I was able to share such a fun experience with my friends! At the finish line, there is a huge party with a stage and DJ’s playing music. They hand out snacks and drinks, and you even get your own packet of colored powder to throw yourself! We had a blast and I can’t wait to get home and do it in Michigan! Any takers? I was back in Poitiers for two and a half days before heading out again, but this time I would be gone for much longer. I would be leaving on April 16th and returning May 5th! 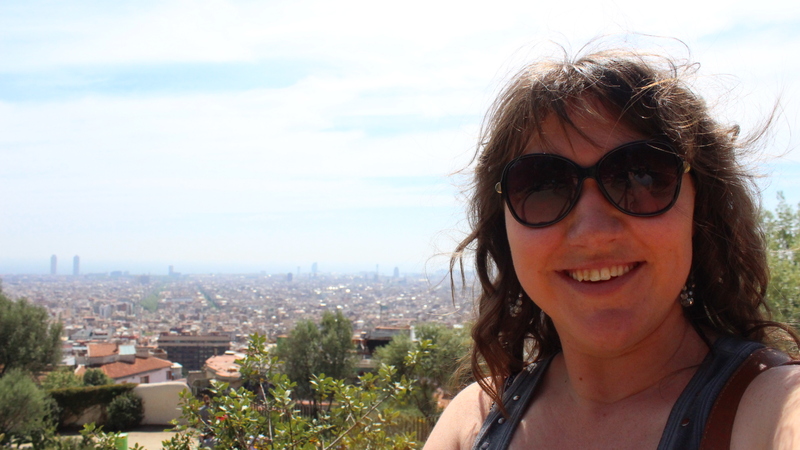 Barcelona has always been a dream and Spain was always one of my top places to visit because of everything I’ve learned from years and years of Spanish class. There was no way I was going to come to Europe and not make it to Spain! 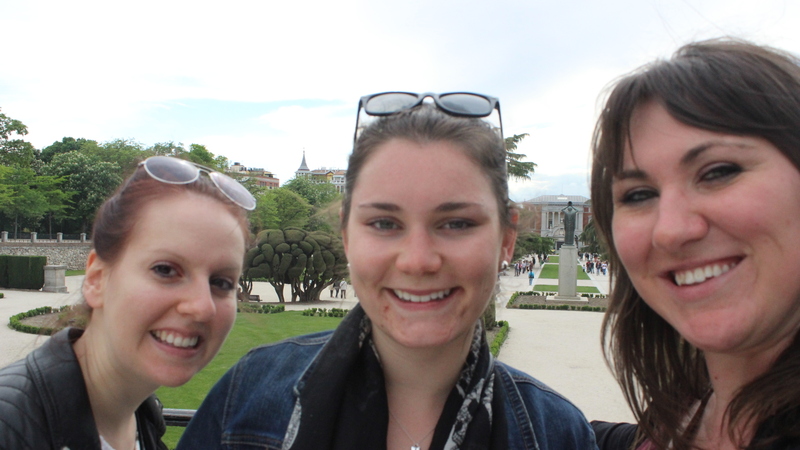 Originally, I booked three days in Barcelona and three days in Madrid with my Swedish friend Kajsa. I told my Canadian friend Katie about our trip and she was interested and joined in as well. Kasja had to go back to Poitiers after Madrid for class, but Katie and I both had a few weeks off so we decided to keep going! From Madrid, we will head to Porto for two days, and Lisbon for four days. We thought it would be fun to fly into Nice and slowly take the train back to Poitiers, making lots of stops along the way. It was a great plan until we looked at flights and saw how insanely expensive it was to fly into Nice. 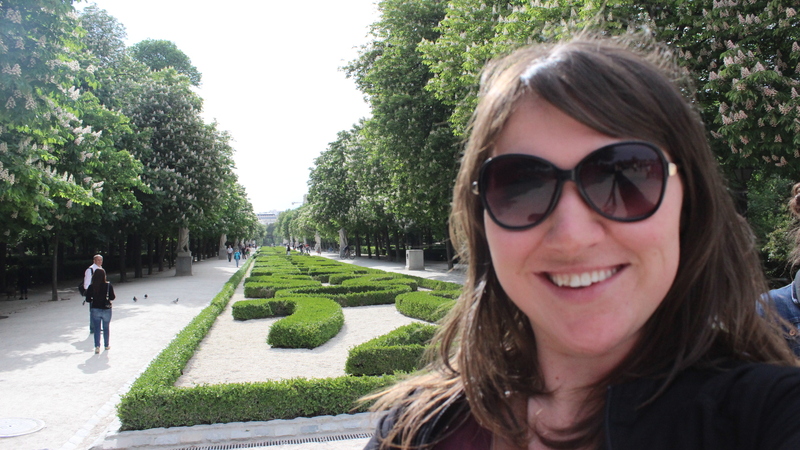 We reevaluated and detoured ourselves to Prague, which we both really want to see! We will spend three days in Prague, and use one of those days to take a bus trip to Vienna, Austria! We will fly back to Paris together and spend the night there. Katie will leave to go back to Poitiers, and I will meet up with my friend/roommate Diego and we will head to Geneva, Switzerland for the weekend to close out my trip. Phew! It’s gonna be a lot, but it’s gonna be amazing! As I’m writing this, (I’m a little behind) I’m already a week in and have seen Spain. It was everything I thought it would be and more. I wish I had spent more time there, but now I have something to look forward to when I come back! 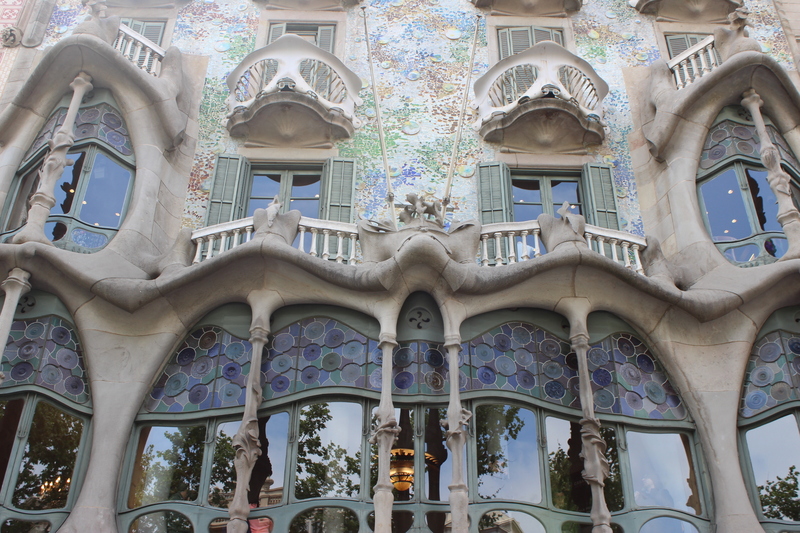 In Barcelona, we stayed at the Feet Up Garden hostel. It was a bit out of the city, but was in a gorgeous neighborhood which most definitely made up for the extra travel we had to do to get to the main attractions. The hostel was great, but the people made it even more amazing (this seems to be a familiar trend wherever I go!). The employees of the hostel were great and went above and beyond for us. I also really enjoyed the rooftop terrace which provided a spectacular view of the surrounding city. 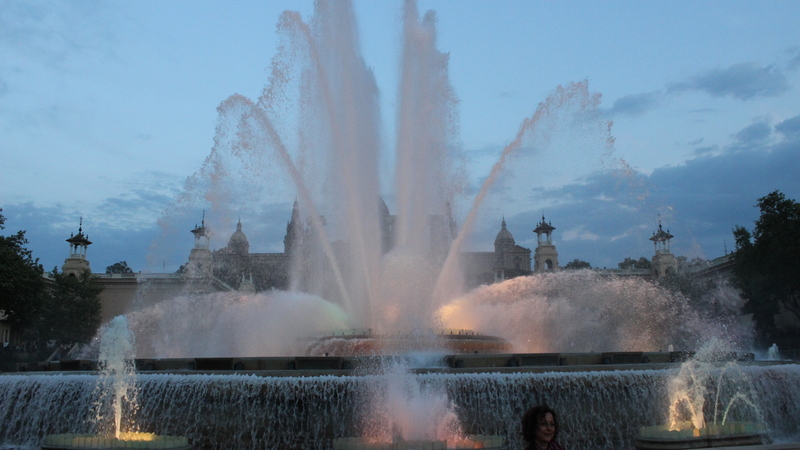 While in Barcelona, we visited the Park Güell, went to see the Sagrada Família Church, and the Magic Fountain show. We also spent a day walking down the Main Street full of shops, store, and restaurants. 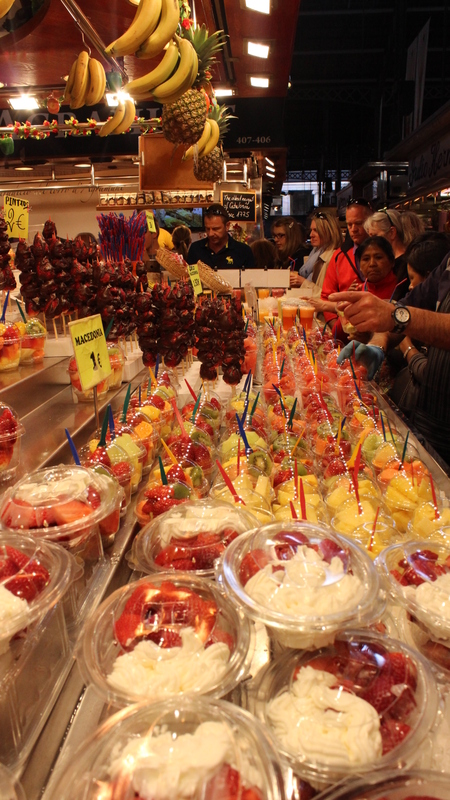 We found an awesome market full of fresh fruits, meats, fish, and more! We had an amazing lunch there at an organic stand and it was the best meal I had while in Barcelona! Veggie burritos, rice, and a spinach snack was nothing I would’ve picked off a menu, but it was so delicious because of all the fresh ingredients! 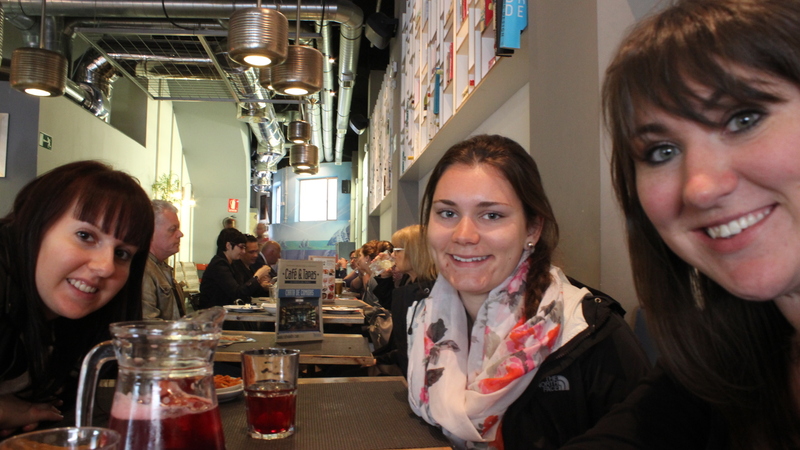 I really enjoyed the market and was happy Katie found it when she did her Barcelona research. We also spend an afternoon at a pier off the main strip. We spent time looking at the water and boats in the harbor, and enjoyed some Paella and Bombas, and of course shared a jug of delicious Sangria! The city was amazing and I was a huge fan of the amazing architecture (which also seems to be a familiar trend). 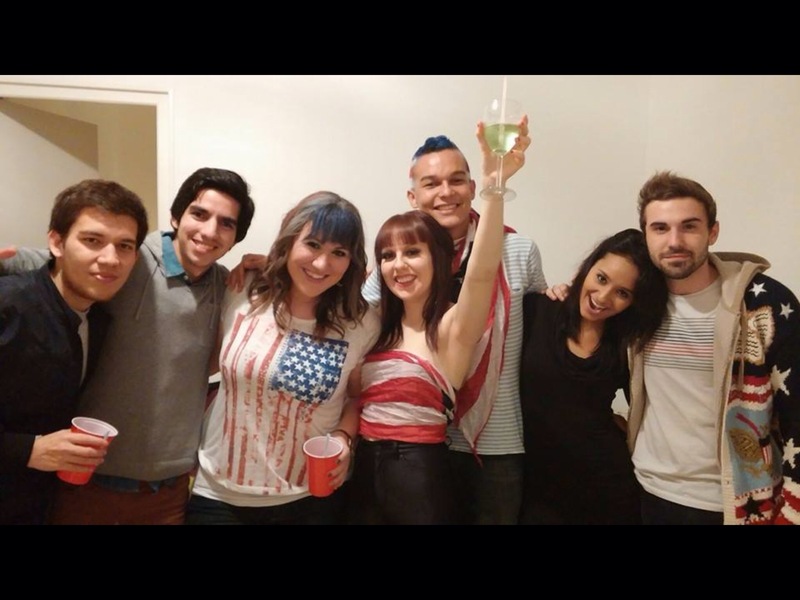 One of my favorite times in Barcelona was spent in our hostel. 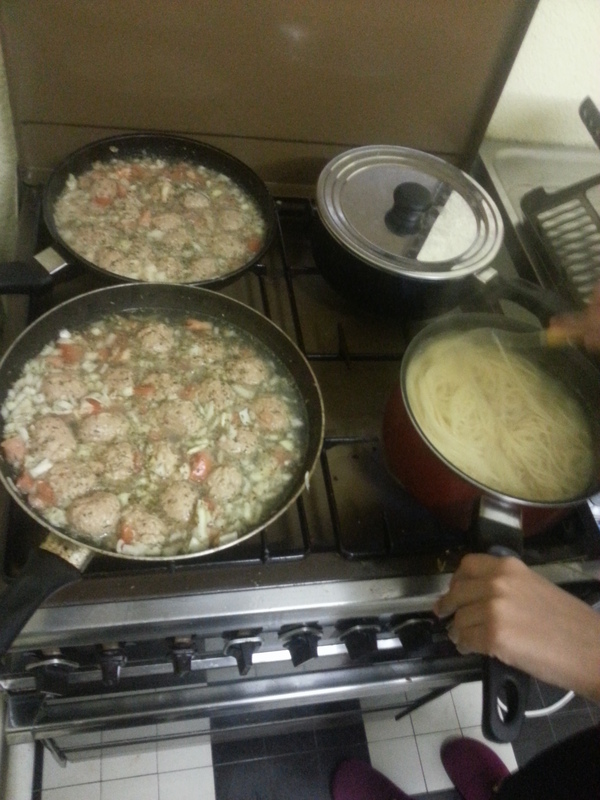 Kajsa, Katie and I made dinner in the hostel kitchen to save money from constantly eating out. While eating dinner, we were joined by Erik, Kajsa’s friend from Sweden. We also met a man named Tomas. He is a politician from Brazil, and a really fun guy to hang out with. The five of us played board games and shared some wine. Things got interesting when we started playing “name all the countries of the EU” and then “name all the states in the US”. I was very proud they knew so many! The night was an absolute blast and I laughed until my stomach hurt! The company was amazing and made the night very memorable! We took the train from Barcelona to Madrid which is about three hours. I got to experience running for the train, and barely making it. Then jumping off, because the conductor is yelling at you and making you think you are on the wrong train. It’s a miracle we made it, and another miracle I didn’t fall or lose anything! 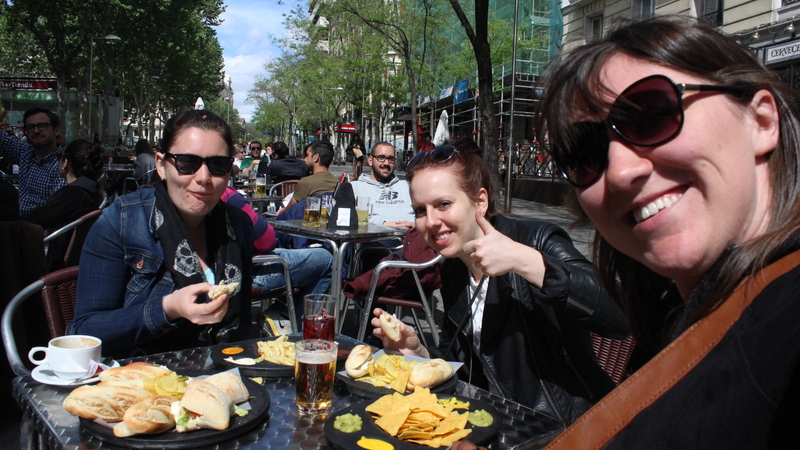 Once in Madrid, we took the metro towards our hostel, and exiting the metro is always a fun time. You usually come up and have not a clue where you are, or what street you’re on, and in some cases, the surroundings are unexpected and you’re stuck looking at what’s around you. Madrid was no different, except for the fact that I know now what love at first sight feels like. 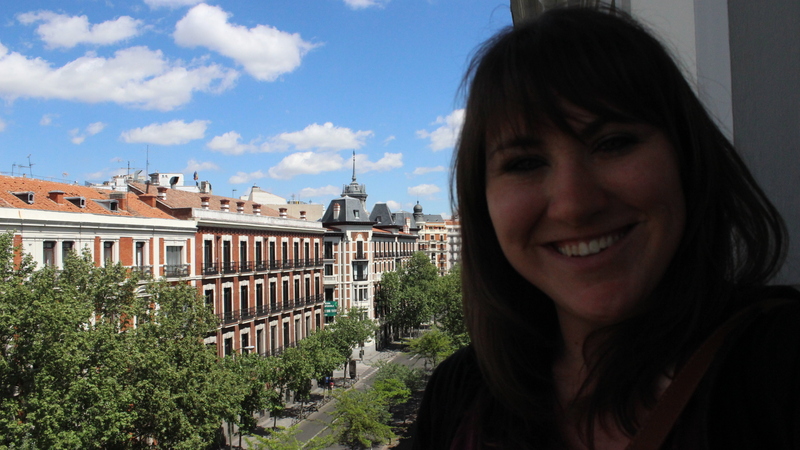 I was immediately in love with Madrid. We found the street our hostel was on and thought it was too good to be true. It was like a scene out of a movie. The weather was perfect which made the blue skies, sunshine, and green trees add to the incredible atmosphere. We were looking for number 22 on the street buildings and couldn’t believe how beautiful our hostel was once we found it. I couldn’t even go inside, I had to stop and take a picture of this gorgeous place I would call home for three days! After checking in, we went up to our room on the 4th floor in an old, glass elevator! (Yes, we were a bit nervous.) We found our room and were thrilled to see a balcony upon entering. We also had turf, and swings hanging from the ceiling outside our room to make it look like a mini park in our hallway! 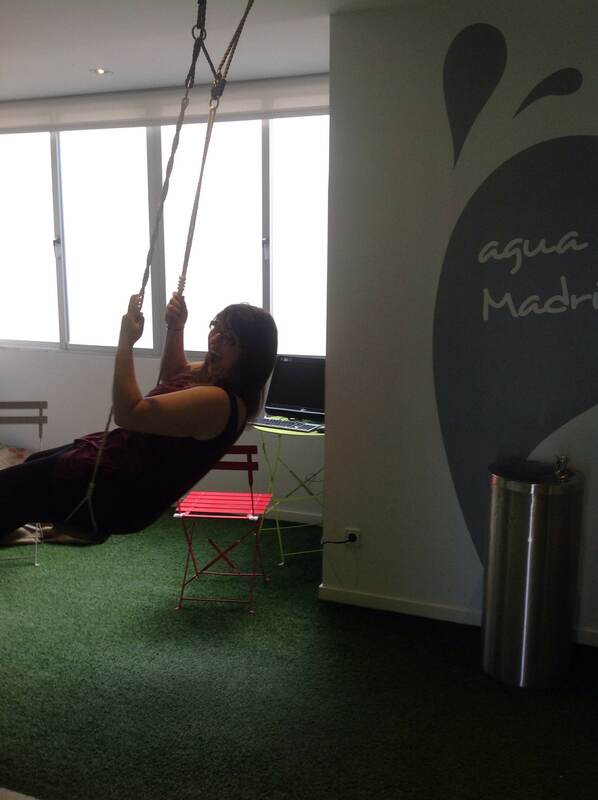 The UHostel in Madrid is awesome! They also have a kitchen, a cinema room, and a great, large common area! I would definitely recommend and return! After coming down off my cloud, we asked the receptionist at the hostel what she recommended for food in the area and wound up at a great sandwich shop. 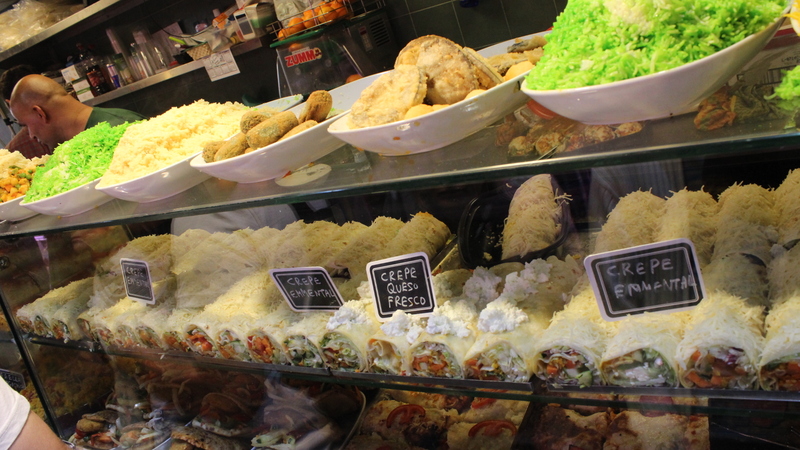 These sandwiches were 2-3 inches long and only 1€ each so you were able to order a few and try different things. We sat outside and enjoyed the beautiful weather on this perfect day! We spent the rest of the day exploring and walking the streets. There were so many beautiful buildings it was easy to stay occupied! We found our way to a gorgeous park and casually walked through this gem inside the city. There was a large pond in the middle where you were able to rent canoes and paddle around. Slowly making our way back to the hostel, we found some great shops, and we I did just as much looking as buying! The next day was our only full day in Madrid (it’s just the way the flights worked), and unfortunately it was rainy and overcast. 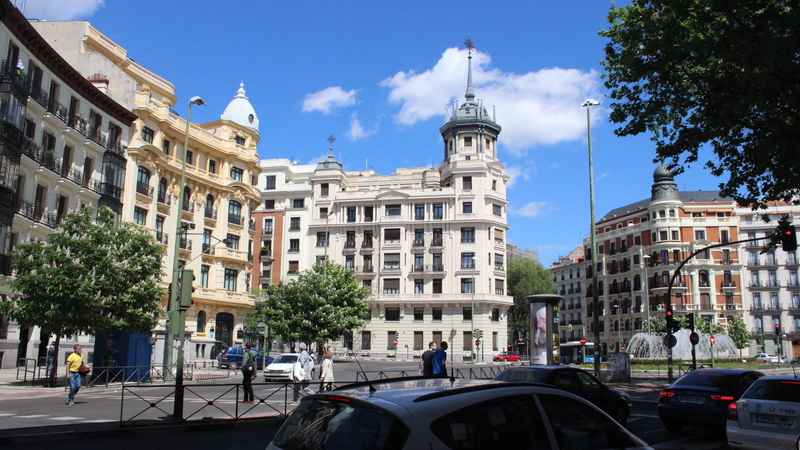 We planned on heading to the Reina Sofia museum, but never made it. We ended up just walking around all day, in and out of stores, coffee shops, markets and more. It wasn’t the best conditions, but we had a great time and I feel like I really saw much more of Madrid than I would have if I stuck with my original plan. Spain was amazing and now that I’ve been there I can’t wait to go back! 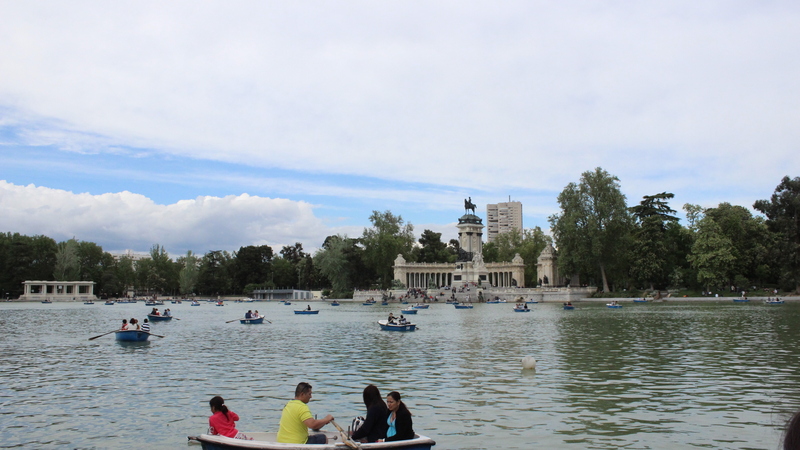 Madrid has made its way to #1 on my list of favorite European cities! I wish I could’ve spent more time in Spain, but now I will head to Porto for two days, and Lisbon for four… Stay tuned for tales from Portugal! My most recent travel has taken me to Amsterdam, Netherlands and Copenhagen, Denmark. This was the first trip I booked when I started studying abroad. Katie, Alex and I booked this trip in late January so we’ve been waiting for it to come for about two months. Although Katie, Alex, and I were the only original travelers, we had some friends who tagged along in Amsterdam, as well as other friends who met up with us in Copenhagen. I’ve found that many of the trips I have booked with one or two other people, have now turned into groups of 7-12 travelers accompanying us. It’s great being able to travel with so many people! After taking the train to Paris, (which we have to do for almost all of our trips), we took an overnight bus to Amsterdam. We arrived at our hostel around 7:00am and relaxed in the lounge until breakfast was available. We stayed at St. Christopher’s Winston and I highly recommend it to anyone traveling to Amsterdam. It’s a younger crowd, but a lot of fun with a great lounge area. Because we couldn’t check-in until 2:00pm, we put our bags in a storage locker and headed out to explore the town after breakfast. We joined the free walking tour of the city at 11:00am and after about 45 minutes of standing in the freezing rain, these tired girls were ready for another coffee! We skipped out of the tour and headed to a place called Crepes & Waffles, which quickly became one of our favorite places in Amsterdam. When 2:00pm finally approached, we made our way back to the hostel for a much-needed nap. The little sleep we did get on the bus, was frequently interrupted and uncomfortable so we were happy to lay our bodies horizontal in our temporary bed at St. Christopher’s. After a nap, a shower, and food, we were as ready as we could be for whatever Amsterdam had in store for us! We ended up walking around and exploring the town which was much more beautiful when it wasn’t raining! We met up with my Australian friends Cory and Yvette, who I met in Rome a few weeks earlier. We toured the streets and walked through the famous Red Light District. On our second day in Amsterdam, we headed to the Anne Frank house/museum and spent a few hours walking through the house and hiding place that’s known so well throughout the world. It was very heart wrenching to be where so much tragedy took place. After the Anne Frank house, we had lunch, then met up with some of our friends at the “iamsterdam” sign. From there, we strolled along the even nicer part of Amsterdam, taking pictures and window shopping. Our hostel was in a really convenient part of town and just a block away from the bar district. We joined in on a pub crawl that night which took us to six different bars within walking distance. It started out nice, but we found that the bars got smaller and more expensive as time went on. After leaving the 4th bar and on our way to the 5th, we passed Crepes & Waffles. Katie, Alex and I decided we would have more fun there than at the next bar, so we said goodbye to our friends and ended the night with some delicious food! On our third and final day in Amsterdam, we went out to a nice brunch and spent the rest of the day shopping and getting souvenirs. Amsterdam was much more than I expected. For the reputation it has, I presumed it would be much more touristy and dirty, but I was happily surprised to find it as one of the prettiest places I’ve been to yet! I would recommend to go there if you have the chance, and hope I’ll get to return someday as well. From Amsterdam, we flew two hours to Copenhagen. I will say that both Amsterdam and Copenhagen have really awesome airports. I was very impressed, and a bit relieved, to see it was much bigger and organized than prior airports I had traveled to in Europe! Both of these airports had a lot of options for food, as well as shopping. I’m talking full on grocery stores, H&M’s, Pandora’s, etc. in addition to all the people watching, (which is probably my favorite thing to do in airports). Upon arriving in Copenhagen, we headed straight for our hostel. Nina and Keya, who we met up with in Amsterdam, also joined us in coming to Copenhagen, and we met up with Kajsa, Michael, and Gloria at the Downtown Copenhagen Hostel so our group grew from three to eight! After settling into our hostel, we went exploring for a few hours. 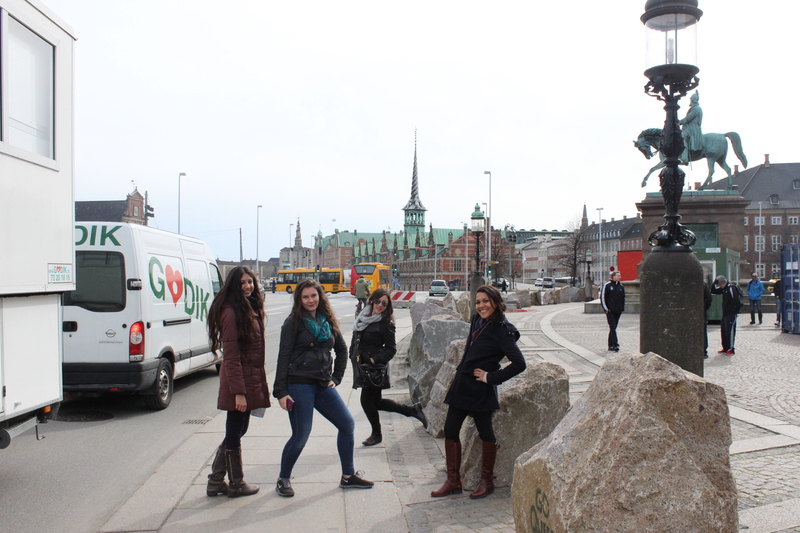 We knew from our journey from the airport to the hostel that Copenhagen was beautiful and had great shopping! It was very quaint, the buildings were colorful and the streets filled with bicycles. The housing architecture and bicycle transportation were very similar to Amsterdam, but there was a much bigger ‘city-feel’ to Copenhagen, lots of shopping and restaurants. Venturing out after dark was fun in a larger city with lots of people and things to do. I was very excited to see a 7-Eleven, a taste of home I’ve missed. (Although after some investigation, I learned they do not have slurpees!) We finished off the night back the Downtown Copenhagen Hostel which has a great common area; live band, bar, coffee bar, foosball, board games, etc. It’s a great place to hang out and meet fellow travelers. The next day was our only full day in Copenhagen. 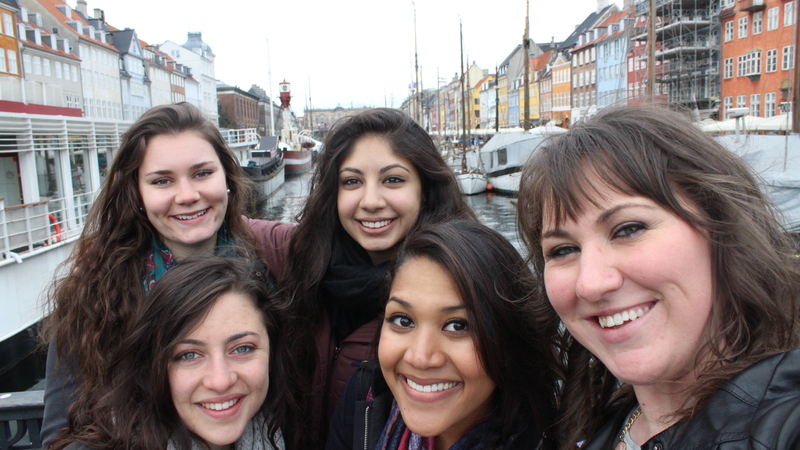 We didn’t realize how little time we had devoted to Denmark, but it turned out to be fine. Although the city was beautiful and there were more things we could have done, it was very expensive (specifically to eat), so we were okay with only spending a little bit of time there. Let me put ‘expensive’ into perspective for you: when we went out to dinner, at a mediocre restaurant, the bowl of chili my friend ordered for dinner was $28.00, and my nachos were $21.00! I think you can tell from the menu items, nachos and chili, that this place was no suit & tie establishment! Being in the 50s, it was cool outside, but many of the restaurants had outdoor seating and every chair had a blanket. It was really cute and almost made you want to sit outside. Unfortunately, the wind and rain had other plans so we spent most of our time indoors. We made the best of the good weather when we could by visiting a famous street with very colorful houses, as well as visiting Freetown Christiania. Christiania is its own town inside of Copenhagen. The government gave them the land, and they have their own law/rules, and even their own currency! After reading many reviews on TripAdvisor, we decided it was worth seeing and went for a look. We were cautioned that since they are their own town, they are free to do what they want. There is a board with rules posted as you enter, and if you choose to disobey these rules, the locals of Christiania have been known to attack travelers and throw them out. These rules included “Have Fun”, “No Photos”, “Buying and Selling Hash is Legal” and “No running because it causes panic”. Here, drugs are legal, and there are no standards. My friend described it as “what the world would look like if it ended”, and I think she summed it up perfectly! The streets were dirty, buildings were man-made out of all different materials (sheet metal, tire rubber, etc. ), there was much graffiti, and everyone looked as if they hadn’t showered in a month. Although it might come off sounding horrible, I was glad we went. It was really interesting to see how a beautiful, upscale town like Copenhagen, has its own world inside it behind a wall that explains how running causes panic! Walking back to the main street from Christiania, it started to rain so we took the opportunity to do some indoor shopping where it was dry and warm! Being a group of girls, all in our twenties, I’m sure you can understand how we managed to survive a few hours inside some stores, but I think you’ll be surprised to learn that our afternoon started at the Disney store with a Tea Party! We are all still very much kids at heart so we couldn’t pass up the Disney store, in which we found the movie Frozen was playing, and there was a table and chairs set up (for five-year-olds) to have a tea party. Obviously, we took the chance to be children again and spent some time watching the award-winning animated movie. We spent the rest of the rainy day going from store-to-store mostly looking because everything was pretty pricy. We found some very cool shops though and enjoyed our time even though the weather was unpleasant. 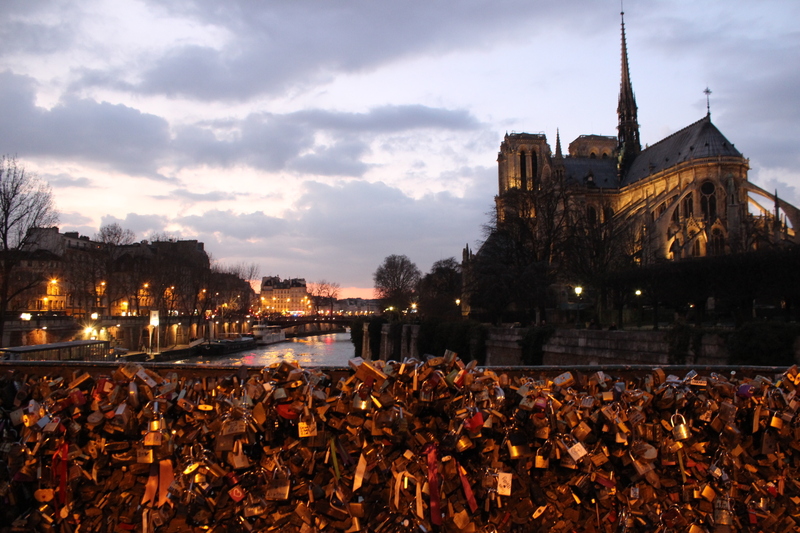 I spent February 27th-March 2nd in Paris. I had flown into the Charles de Gaulle airport when I first arrived in France, but had to run to meet my train and had no time to spend in the city. I’ve been in France now for two months, and was finally able to make a trip & spend a few days in Paris. Seven friends and I planned a four day weekend in the city, and it was absolutely amazing! My housemate Elizabeth has a friend in Paris named Lorelei. Lorelei is from France and met Elizabeth when she was studying abroad in South Carolina. Elizabeth let her know we were planning a trip to the city, and asked if she could recommend some of her favorite places that we should see while we are there. Lorelei took it 10 steps further and got us all rooms at the Novotel hotel where she works! A four star hotel, a 15 minute walk from the Eiffel Tower, for less than we would’ve spent at a hostel…. Yes please! The Novotel hotel was amazing and I recommend it to anyone traveling to Paris. We were also able to get vouchers for breakfast which you must pay extra for if booking as a traveler, but it was a great spread, and my American friends were all very pleased to see bacon! 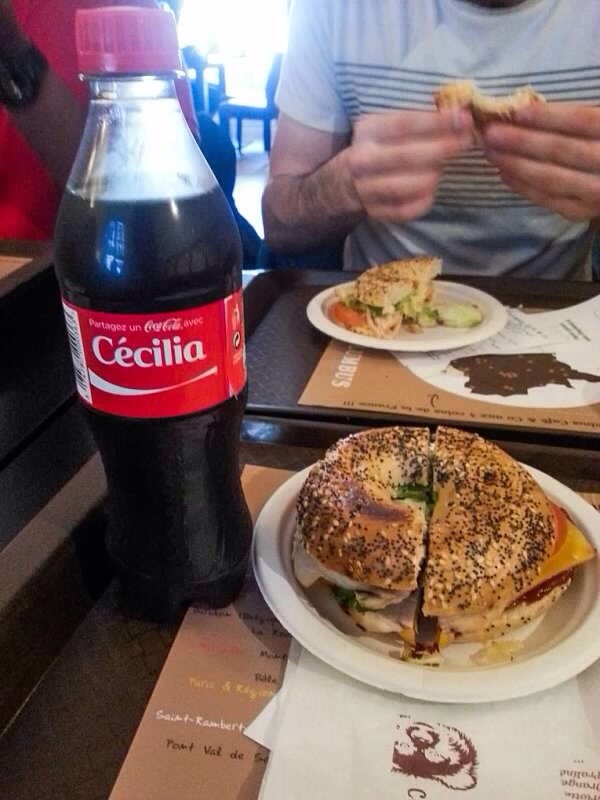 (A rare commodity here in France.) The rooms at the hotel were great, and the lobby area was very impressive! There were computers available to the guests and many nice sitting areas for tired travelers. I hope to stay there again with my family, when they come to visit in May. Checking-in to the hotel took a few minutes because we had three separate rooms booked, but were only checking into two of them at the moment. (The others had class and would meet up with us later.) As the receptionist verified all of our information and started programming room keys, she started going through (what I like to call) “the check-in spheel”. She proceed to give us the information to connect to the wifi, pointed us in the direction of the breakfast room, and then smiled, handed us the keys to our rooms and said “You’re in rooms 1301 & 1303. The elevators are down the hallway to your right.” The words she said had stuck me like someone walking into a glass doorwall… 13th floor?! They do exist! It was the first time I had ever been in a hotel with a 13th floor! There’s a first time for everything! Remarkably, Lorelei’s generosity didn’t end there. We knew we wanted to do something special for her for getting us such great accommodations, so we asked if we could take her out Saturday night. We asked her to take us to her favorite place in town so we could treat her, and also to see where the local’s like to go! Not sure what to expect, we started out on our adventure. When we asked Lorelei where we were headed, she replied with “it’s a surprise!” My excitement was growing as we took one metro, to another metro, and started walking around the town we eventually settled at. Following the leader, Lorelei led us around a corner where we faced a huge, steep road. It was one of those ‘out-of-breath’, ‘feel-the-burn’ type hills. Once at the top, we walked another 30 feet or so, and found ourselves battling an even longer, steeper hill! I have been up and down many hills in Poitiers, but these were exceptional! I was waiting for someone to award me with a Girl Scout hiking badge! (Okay, I’m being a bit dramatic, but you get the picture!) We were all a little curious if this was going to be worth the treacherous hike. Let me be the first to say it was absolutely, 110% worth it! We found ourselves in the center of a small Parisian town square with the most perfect ambiance you could imagine! Complete with caricature artists, live music, restaurants, and a beautiful church, I can’t think of anything that could have made the mood any better! We had dinner at one of the bistros in the square, which was absolutely fabulous. I had beef bourguignon, and it was by far the best meal I’ve had since I’ve been in France! After dinner I walked around with a friend to see some of the shops. 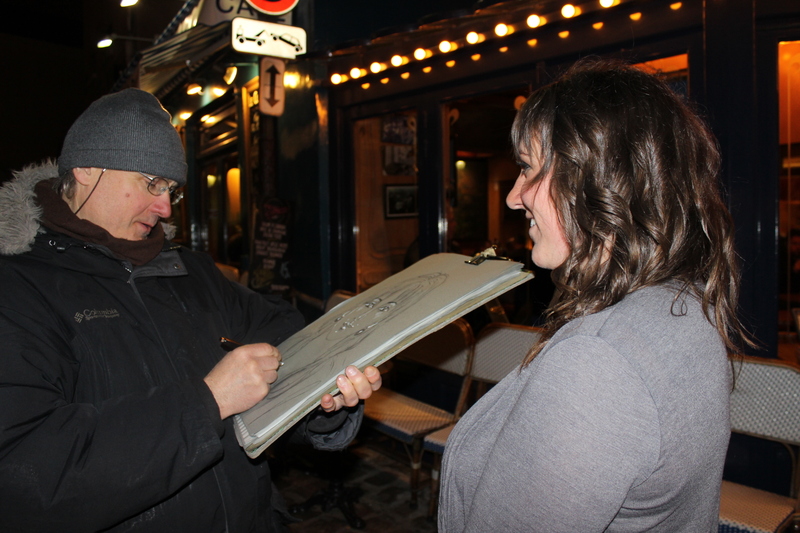 We got about 15 feet outside the restaurant before we were approached by artists that started drawing sketches of us. I was completely aware that I was a typical tourist/target, falling into the trap, but at the moment I was content with it. The night was already amazing so why not make it even better?! I came home that night with a souvenir sketch, (that looks nothing like me, by the way! ), but it’s a fun memory of that night. After dinner we took a walk and exited the square on the opposite side of where we entered. Lorelei took us to a lookout point of the entire city and it was absolutely breathtaking! If you’re ever in Paris, take the metro to Abbesses and walk up each hill until you reach the top. You will thank me, I promise! Of course, one of the biggest highlights of the trip was getting to see the Eiffel Tower. With our hotel so close, we were able to see it pretty much anytime we wanted to, and made many trips there to take pictures & just enjoy the view. We also visited the Louvre, and hung out with Mona for a bit. 🙂 My best friend in Poitiers, Diego, didn’t plan to come on this trip, and as we were leaving & saying goodbye, I said “I wish you were coming!” I was chatting with him online the next day, and told him how I missed him & that he should be here with us. He took it all to heart and surprised me Saturday! He met us at the museum and spent the rest of the day with us. Such a great friend! It made my trip so much more enjoyable! From the Louvre, we walked past the shopping district to the Arc de Triomphe. After standing and walking for the entire day, we wanted to sit down for a while. Finding a Starbucks, we grabbed a cup of coffee and sat in a McDonald’s just talking and relaxing. I know what you must be thinking, “You’re in Paris! Why are you at Starbucks and McDonald’s?” Believe it or not, it was delicious and missed on my part. I don’t go to either of these places very often at home, but having them available to me was a nice change. 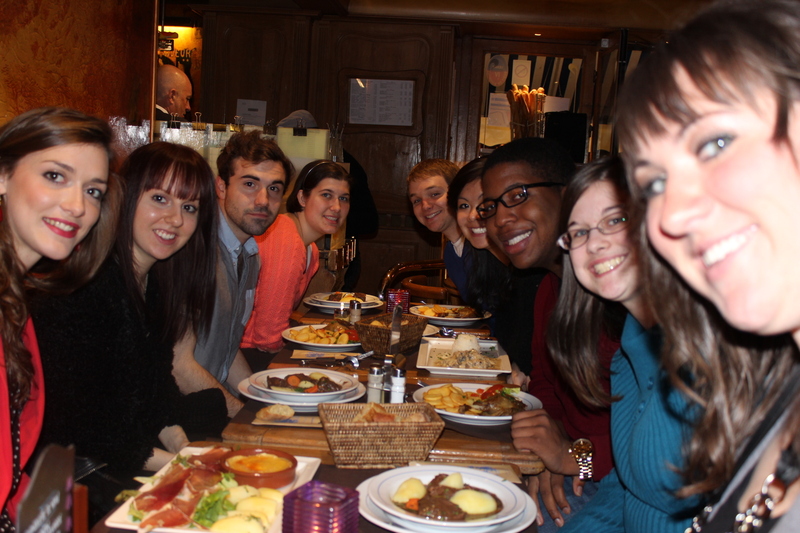 Don’t worry, we ate at plenty of great French places in Paris as well! We made a trip to see Notre Dame and entered just as a mass was ending, very powerful and simply breathtaking. From there we walked to the famous Love Lock Bridge, and also visited the cemetery where Jim Morrison is buried. 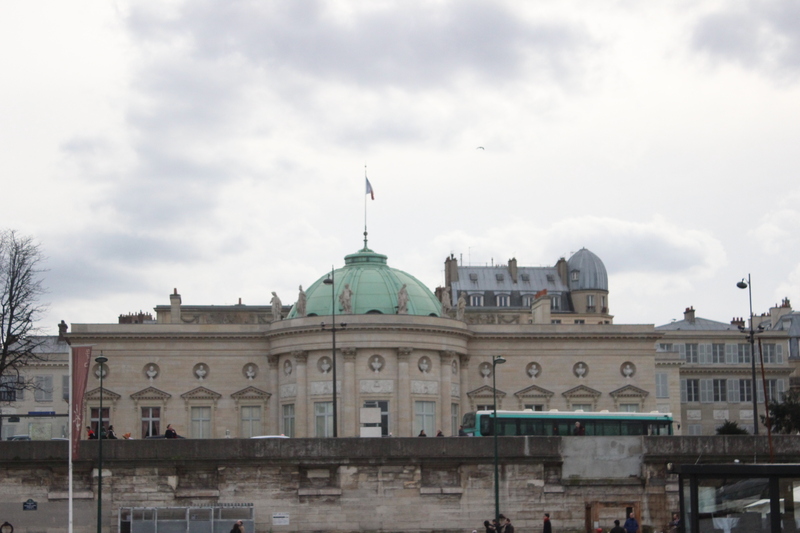 On Sunday, our last day, we took a boat tour along the River Seine. Our hotel room had a great view of the river so it was nice to end the weekend with what we had been looking at for four days. The tour was an hour long, and cost 13€. In my opinion, completely worth it! We were able to see Paris from a different angle, and there was commentation in French, Spanish, and English that was very interesting! I learned that the White House was build with inspiration from the building in the picture below. I also learned that their Statue of Liberty was originally facing the Eiffel Tower, but was turned in 1889 so that the Statues of Liberty in New York and Paris (the sisters) would be facing each other! It can also be seen in the movie “National Treasure: Book of Secrets”! Overall, the weekend was amazing! Visit https://thetwentysomethingtraveler.shutterfly.com/ to see all of the pictures! We were definitely exhausted when we came home, but it was totally worth every minute! I will be returning to Paris in April for a 5K, and again with my family in May. It’s crazy to think that I am traveling to all of these places and seeing all of these landmarks that I’ve only dreamed of. I am definitely taking in every second. I realize this is a chance of a lifetime, and am not taking anything for granted. To think I am already halfway through with this experience is sad, but if it ended tomorrow I would be so happy with the places I’ve seen and the people I’ve met. Speaking of grocery stores, that is also something you have to plan ahead for… Since I don’t have a car here, I make many trips to the grocery store each week simply because I can’t always carry everything I need in one trip. (My fridge isn’t that big anyway!) There are two grocery stores that I can walk to from my house. They have most of your basic items. There is also a superstore (like a Walmart or Meijer’s) that I can take the bus to when I need more specific items. If I am going for more than just a few things, I usually take my backpack because it holds a lot, and it’s easier to carry home. One thing you should note when going grocery shopping in Europe, is that you need to bring your own bags. In America, you can get as many grocery bags as you want, (and I’m pretty sure everyone has a drawer in their house dedicated to these bags!). In an effort to be a greener continent, you have to pay for your bags here. They are not horribly expensive, and there are different kinds. The typical, disposal ones are about 0.04€, and one that is heavy-duty and reusable is around 2.00€. You also bag your own groceries. Because of all these reasons, many Europeans go to the grocery store several times each week. To go to the store and buy food for the whole week is uncommon. You may buy enough food for a few days because that is all your fridge can hold and all your hands can carry. Of course this is mainly in the cities where walking is the main mode of transportation for many people. There are obviously many exceptions to this, but from what I’ve learned thus far from living in Poitiers and talking with people from other towns, it seems to be quite common. Most everything in Poitiers closes at 7:00pm during the week, and is closed on Sundays. However, there are certain things that are open longer, like the laundromat, and a school building where students can go to do homework. Since both of these establishments have extended hours, and neither of them have security, the doors have a special button to allow you to get in and out. There is a button, that looks like a doorbell, that unlocks the door. There are also similar buttons in hallways which activate the lights, since most lights are motion activated. If you find yourself locked inside a building, or roaming around in the dark, look for a doorbell type button to relieve your panic. It’s quite alarming to think that you’re trapped inside a dark laundromat by yourself at 9:00pm! The last fun tip I will share with you is something I’ve found to be a benefit, but I still haven’t gotten used to it yet. In the past, I have worked a handful of jobs where I’ve depended on tips. Because of that, I always try to be a “good tipper”. In France, and most of Europe, it is actually insulting to tip! The wages here are much different and the waitstaff is paid much more than what is considered normal in the states. Their tip is figured into their wages, so employers have higher expectations from their staff. If you do leave a tip, you are implying that you don’t think they make enough money and you are giving them charity. This is the same for restaurants, bars, hotels, etc. Although I think it’s a good thing, I’ve found myself trying to tip more than once, then remembering that it’s not normal here! While sitting at dinner one of the first nights I was here, I learned this gesture. We had finished eating, and the waitress asked us if we wanted an espresso or dessert. After replying no, she walked away, and for about the next 30 minutes we continued to watch her walk by us constantly while we talked at our table. Finally, one of the girls said, “Her tip is going down by the minute! Why isn’t she bringing us our bill?” We soon found out that the phrase she just spoke was one of the most American things she could’ve ever said! First off, we learned that you don’t tip. 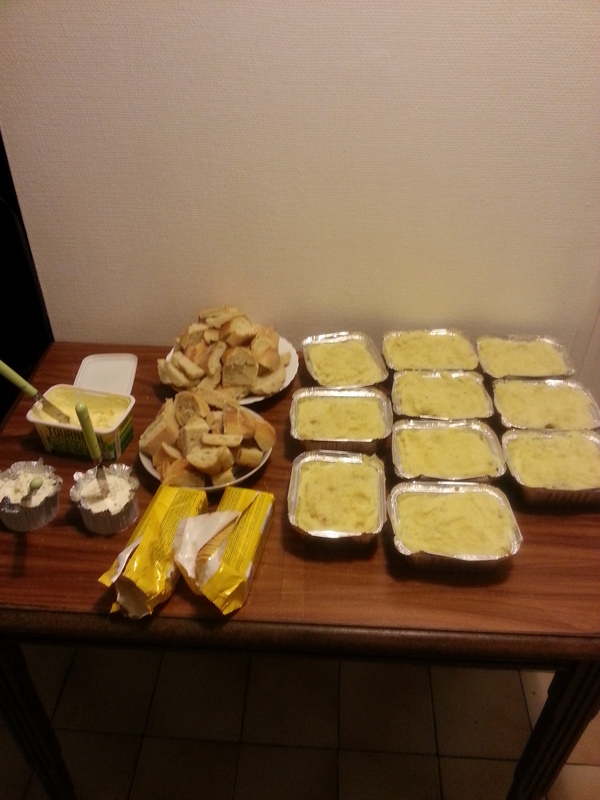 Secondly, dinner (and all meals for that matter) are meant to be long and social. Lunch here is 2 hours long. The social aspect is the biggest and longest part if the meal. After you’re finished eating and socializing and you wish to leave, you have to ask for your bill, or, in many cases, find the counter with the register and pay there. A bit difference from what I’m used to, and definitely something that’s good to know! I am very excited to announce that I am signed up for a 5K! 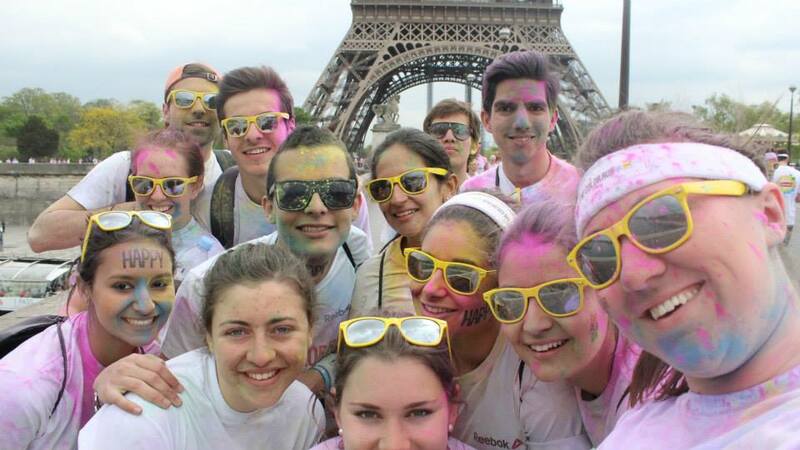 On April 13th, I will be running (more like walking), in The Color Run Paris! This is my first 5K, and although I will not be able to run the whole thing, I am just excited to be a part of the experience! I’ve wanted to do The Color Run for a few years now, but never had the opportunity. To be able to be a part of it, (and in Paris! ), is simply amazing! There are about 30 of my international friends who are doing it as well, so it will make for another memorable weekend and Parisian adventure! Now I am off to enjoy my first weekend in Paris! In the time since my last post, a lot has been going on! I started a ‘class’ called “Company Project”. This was described to me as a type of internship I’d be able to participate in. Basically, instead of sitting in a classroom, I would be working with an International Company, based in Poitiers, and help them execute a project. I thought this would be a great opportunity, because not only will I get the experience of going to school in France, I will also be able to say I interned with a company there! I’ve had a few meetings regarding this project, and it turns out that there are not any companies in Poitiers who do business internationally that need interns. I will actually be working for the school I am attending while I am here. Although it didn’t seem to be what I had anticipated, it is turning out even better! As part of my project, I will need to help students who are based at France Business School, and are going to study abroad at UM-Flint! I will be helping them adapt to everyday life with things like housing, transportation, food, etc., as well as planning 6 trips/excursions for them while they are in Michigan! I will need to organize, arrange, schedule, and budget these trips so it is easy for students to see what is offered. I am so excited to be able to show everyone what Michigan/US has to offer! It’s turning out to be a really fun project! I’ve learned that there are currently two French students at UM-Flint, and I was able to make contact with one of them. Unfortunately, the winter doesn’t seem to allow for much fun right now (with record breaking temperatures and snowfall! ), but I hope they will get to enjoy the spring! I am really excited to work with future exchange students once I return home as well! 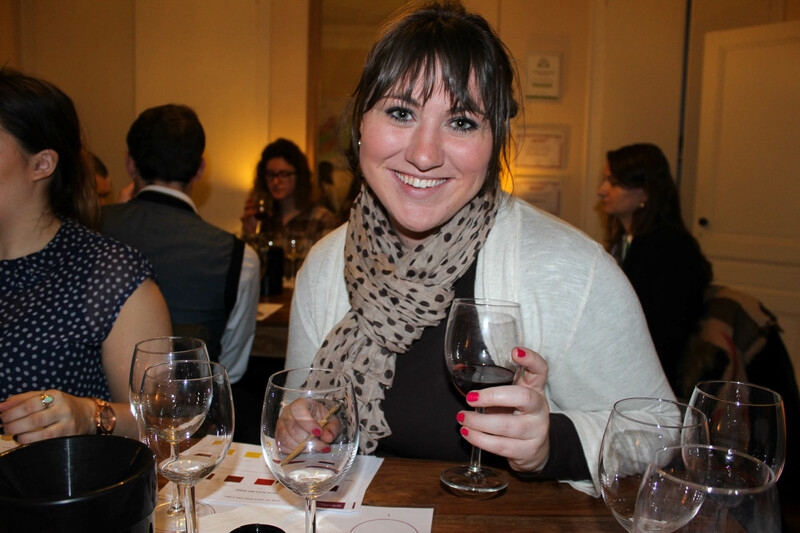 I took a day trip to Bordeaux on February 8th to go wine tasting! It was actually a ‘tasting class’ where we were educated on the wine, where it originated from, what to look for in the taste, etc. We tasted 8 different red wines, all from France! 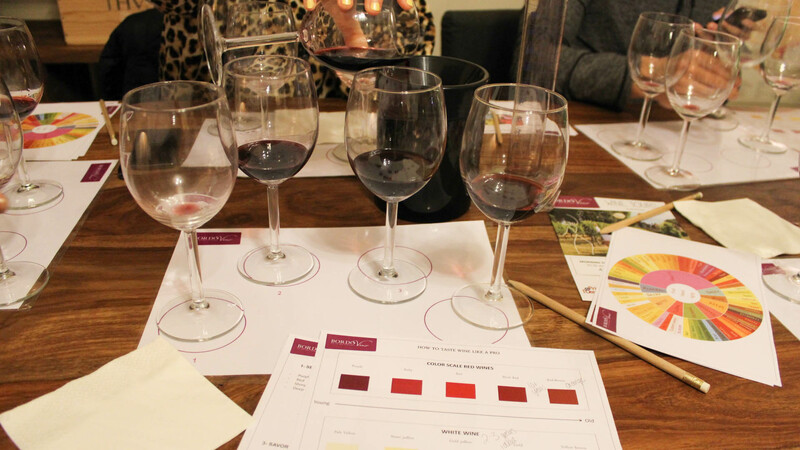 It was a lot of fun and after being in the class I feel like I really know how to properly drink and taste wine! I went with 4 other friends, and after the 2 hour wine class, we roamed around the city and found this HUGE market! It was one street for as far as you could see filled with vendors selling everything from sausages to shoes! A few weeks ago, I was contacted by my roommates mother. My roommate, Elizabeth, is from South Carolina (another American! ), and one of the sweetest, most genuine girls I have ever had the pleasure of meeting! It is really a blessing that we were placed in the same house together! Her mother reached out to me, asking if I would help surprise Elizabeth for Valentine’s Day. Their church group had all gotten together, and donated some money to send Elizabeth to make her time here a little more enjoyable. Obviously, I was all-in! I LOVE surprises, and planning a creative reveal is my speciality! So Saturday, February 15th, Elizabeth thought we were going out to lunch, and catching up on episodes of Duck Dynasty. 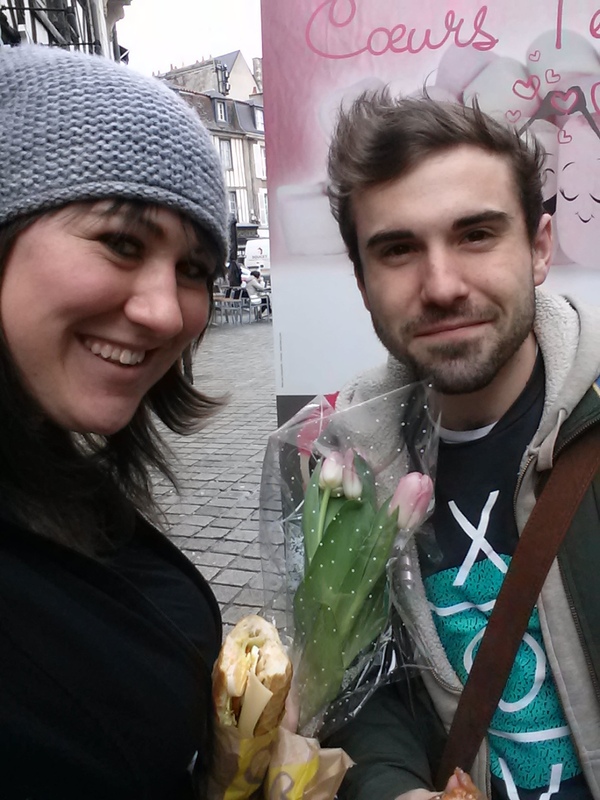 Little did she know, I planned a scavenger hunt around Poitiers! I had clues leading her to her favorite spots around town, and even had some friends waiting at each location. When she thought the surprise was over, and we were going to start watching D.D., she was shocked when she saw a familiar face on the screen instead of one of the bearded Robertson men! I was so thankful to be part of this surprise and so glad her mother reached out to me. Seeing the look on her face during each reveal was one of the best memories I’ve had since I’ve been here. Great day for a great girl! My international friends have truly become my family and recently, we’ve had few family dinners! 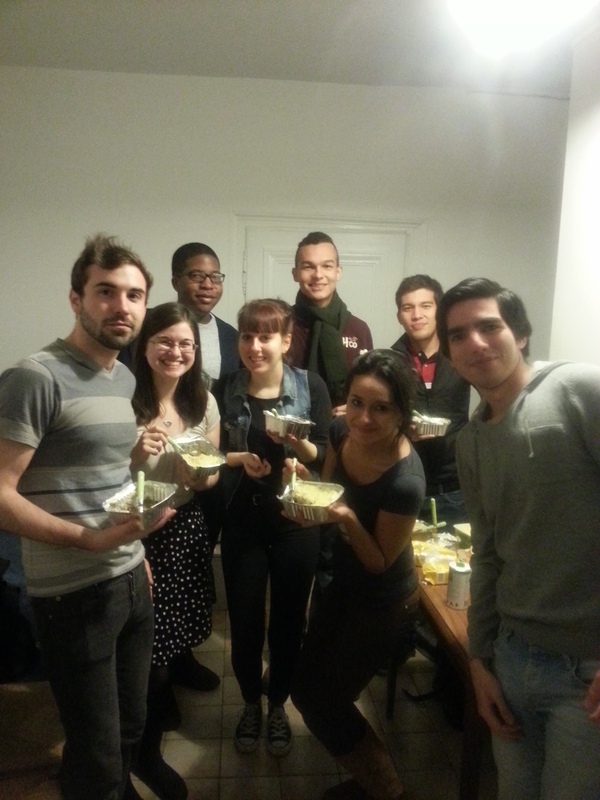 My Columbian friends, Germán and Paula, made me and a few friends their Meatballs! I’m not exactly sure how they cooked them, but… WOW, they were amazing! I brought a side dish, and introduced them to my mashed potatoes! The next night I cooked Shepherd’s Pie for 9 of us, and seeing as how I did it without an oven, I think it turned out pretty good! Everyone was quiet and there were no leftovers so that’s always a good sign! I love trying new foods from different cultures, and seeing how everyone makes certain dishes. The Colombians put cut up hot-dogs in their meatball sauce, and even though I don’t, I know many people put cheese on their Shepherd’s Pie. The variety of customs we have is amazing! I’ve been keeping busy in my ‘off’ days by… planning trips! A huge part of being here is being able to see different countries, and experience new cities. Even many of the teachers will say “let me know what day is good for you, I know you’re here to travel too”! It’s nice to know that the school encourages you to travel while abroad, and your schedule allows for some great trips! (But just remember, you work hard so you can play hard!) Last time I talked to my dad he asked, “So how is travel agent school going? !”… It’s going great dad! 😀 I’ve gotten to the point in my calendar where I need to start thinking about which trips are really important to me because there are so many trips planned, I don’t have enough time to participate in all of them! I have created a new page for my Calendar so everyone is able to see where I’m at and where I’m going! (Look at the menu bar at the top of the screen.) I’ve been so blessed with the opportunity of being here… you can bet I’m taking full advantage of it! My next trip will be with 8 friends to Paris for 4 days at the end of the month to explore the city. Elizabeth knows a friend who was able to get us an AMAZING deal at a very nice hotel near the Eiffel Tower which will make the trip even more memorable! We will also be celebrating Katie’s birthday that weekend, and I’m sure she won’t forget this birthday party! I’m excited to spend a few day in Paris with some lovely ladies! 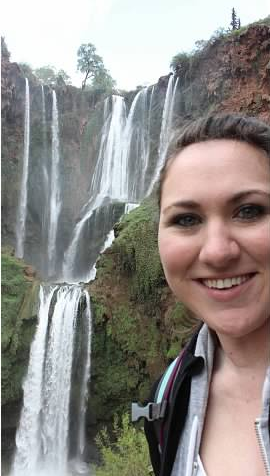 I am definitely keeping busy, planning trips for exchange students visiting UM-Flint, keeping up with my online course as well as courses here, and planning trips for myself! The next few months are going to fly by and I’m just trying to live in each moment and not blink for too long! I constantly find myself walking up and down the streets of Poitiers (or wherever I may be), and really take in the fact that I am living in France!